Next, the clever insertion of the recipient’s name as a part of the artwork had the effect of the recipient pausing to look a little more closely at the mail piece – more interested in the graphics than the content. While we agree that anything that would cause a recipient to spend more time looking at a mail piece is a good thing, we feel that most people are missing the tremendous advantage of using variable data. If a campaign does not have access to enough data to structure multiple versions of a piece, we would advise against the added cost of a technique that would likely prove ineffective. A generic image and message will probably not benefit much from simply dropping the recipient’s name one or two places in the contents. However, if a campaign does have access to enough data to structure multiple versions of a piece (text and graphics), it is a marvelous candidate for a meaningful variable content mailing. 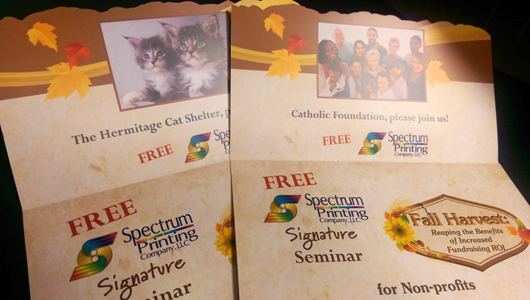 In the example image provided in this blog, it's most relevant to include an image of kittens for an event invitation addressed to a nonprofit cat shelter. In comparison on the right, a religious organization's invite displays an image filled with a diverse community of people. In both examples, the organization's name is printed--also in addition to the individual's name on the on the reverse side. We believe that, to maximize the effectiveness of a piece and to generate the ROI to justify the added cost, the variable must visually appeal to the recipient and speak directly to them with a message they would find of interest or importance. In other words, using known data about the individual recipient to utilize captivating imagery to get their attention and to create pertinent messages of interest to the reader and influence an action. This is the way to really make variable data printing work for you. Now, let's take your next variable data printing project to the next level of personalization. Call us at (520) 571-1114 and let's create a message that resonates with your target audience.